If juice cleanses aren't your thing, but you still want the benefits of an occasional green juice Dr. Oz has the solution. I recently purchased a Vitamix and Green Juices were one of the first items on my list to try. I love Naked juice smoothies and was determined to make my own. 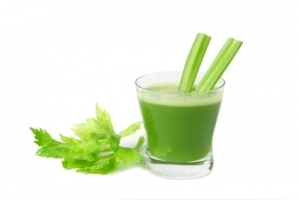 This Green Juice Dr. Oz created is tasty and includes several of your daily vegetable servings. I love using the Vitamix to make this juice because it really blends up all of the vegetables to a smooth consistency. There is not much fruit in this Juice so it takes a little getting used to but just think about how good it is for you while you drink it! Mix all ingredients into a blender and blend until smooth.